Edit your collections! Don’t try to use everything that you have. Declutter your ornaments, snowmen and Santas. Use sparingly and use what you love most. Don’t hesitate to donate what you no longer use. There is a fine line between classic holiday decorating and too much! Table it for now! If your dining room table just sits there taking up space except for a couple of times a year, use it for a holiday tablescape. Start with a pretty holiday runner and use candles of different heights and widths as your start. Fill it in with greenery, poinsettias, a few ornaments, small holiday trees or sea glass sprinkled throughout and you have a beautiful holiday tablescape. This works for any table. Small space? No problem. If your space is small, don’t overdo it. 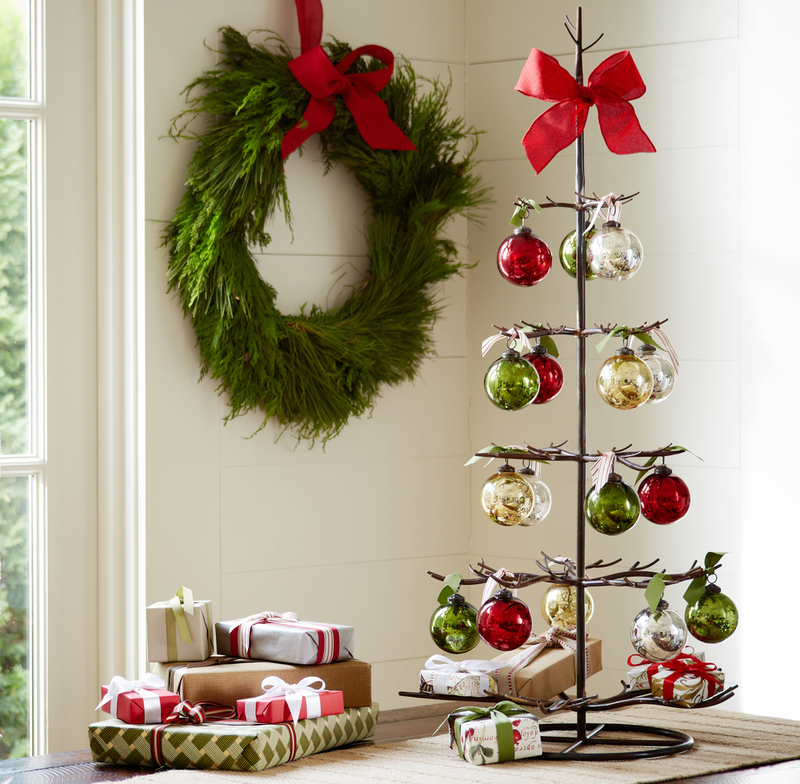 A small tabletop tree, a wreath and a few wrapped gifts will make any space festive! And when the holiday is over, you will not have as much to put away. Small spaces are not a problem for Pottery Barn's metal ornament tree. Photo: Pottery Barn. Seeing too much red? Feng Shui teaches us that there can be too much red or “fire” energy in our homes this time of year. It promotes burnout and who needs that over the holidays? To prevent an imbalance, think about using more green than red. Plants, and evergreens decorated with “cool” colors such as light blue, silver, white will tone down and balance out the red. Trade secret: Designers like to use white lights and pick two colors for holiday decorating. Cool, calm and beautiful! It works. Roundup the collections! Don’t let your Santa collection scatter all over the house. Group your collections together. Snowmen on a beautiful tray make a much nicer presentation than having them in every room. Feather your nest! Change your tree by using your collectible ornaments but add colorful or white feathers for an updated, new look. They are available at any crafts store. Add some bling! Jewel tones this season are the rage. Crystals, metallics, and beaded ornaments will give your tree a little sparkle and will go with your existing ornaments or go for the glam use them for the entire tree. You’re almost done! Put up the stockings pick out your favorite holiday music, turn on the lights and enjoy the holiday season. Remember: Take a picture so you can duplicate it next year! Want to turn plain rooms into Spectacular Spaces? I can help. Contact me! Follow me on Facebook.